Paul Ryan is no stranger to gun control. It’s important to remember that, and what we’re going to discuss isn’t anything new for Ryan. As an aside, it’s remarkable that the Congress, when they lost that horrible worm John Beohner, couldn’t even break from the establishment any more than to put in a man just as connected to the establishment. Let’s be clear – Paul Ryan isn’t controlled by the establishment, he is the establishment. At any rate, he’s promised to give gun control a hearing in Congress. A week after Democrats staged a nearly 26-hour sit-in demanding a vote on gun control measures, Speaker Paul Ryan (R-Wis.) said the House will vote next week on legislation to block suspected terrorists from buying guns. It’s unclear exactly which bill will be brought to the floor. Democrats launched a daylong protest on the House floor last week demanding a vote on such legislation in the wake of the Orlando shooting rampage that killed 49. Ryan on the call reiterated that it’s important to ensure suspected terrorists can’t obtain guns, calling it common sense. But the Speaker said he wanted to approach the issue deliberatively to protect due process and Second Amendment rights. The House next week will also take up a bipartisan bill by Rep. Tim Murphy (R-Pa.) that seeks to address gun violence by overhauling the mental health system. That bill recently cleared the Energy and Commerce Committee. A Democratic source said the more controversial gun-purchase provision may be similar to a bill sponsored by Sen. John Cornyn (R-Texas) that’s backed by the National Rifle Association. David Codrea weighs in on this. Define “due process.” Is it being charged, tried in accordance with laws respecting rights, and found guilty before being denied a fundamental right? Or is it some law enforcement careerist using a secret list of undetermined sources and reliability convincing a judge or panel of unknown political sympathies that some tenuous “probable cause” alibi exists? The same concern applies to mental health-related gun prohibitions—has the “accused” been afforded the equivalent protections of a jury trial, or is someone who may be quite learned in the field of mental health and quite ignorant and opinionated about “gun control” all that’s needed to sign off on a “no guns” life sentence? And I’ve argued the same, but quite frankly I’m becoming very disillusioned at the so-called “criminal justice system” in America, all of it, and I see no reason to believe that a trial by jury would yield anything better than an empowered federal executive. Remember that half of America routinely votes for communists anyway, and most of the other half is often confused. David issues this warning though. The correct position for the Republicans to take on guns, since the only clear mandate is the right to keep and bear them shall not be infringed, is to reject all citizen disarmament attempts, and make the monopoly of violence cult fight for every inch. We know that’s the end game, so why cede any beachhead from which they WILL launch further attacks? Why make any concessions, even on a floor vote? What, are we going to find out which politicians are anti-gun? We don’t already know? Of course, there is no legitimate reason to pursue this any more in Congress. As I’ve observed before, gun confiscation on a massive scale won’t happen in America. The progressives will nickel and dime us to death, with everything from mental health checks to domestic abuse record keeping where the mere perceived threat of harm is enough to place a person on the no-gun list with all of the white patriots in flyover country who believe in the second amendment. The thing progressives have going for them is that they aren’t purists. They aren’t looking to get everything at once. They are incrementalists, and will take less than perfect in their eyes in order to achieve the desired end state. The grand progressive plan isn’t to go all in on collection of guns at once. It’s to bleed the country dry, death by a thousand cuts. Paul Ryan is currently negotiating what the next cut will look like. Hickok45 is a lot more disciplined than I am, but he gives good (but simple) advice on how to keep care for your weapons when not in use, avoiding rust and scratches. Y’all know what I think about anti-gun nut South Carolina state senator Larry Martin. Well, good things do happen. Former S.C. Rep. Rex Rice defeated powerful S.C. Senate judiciary committee chairman Larry Martin in a battle of dueling status quos in the Palmetto Upstate. With all but three Pickens county precincts reporting, Rice won 6,010 votes (54 percent) compared to Martin’s 5,076 votes (46 percent) to claim the “Republican” nomination for S.C. Senate District 2 (map here). Two weeks ago, Martin got 45 percent of the vote to Rice’s 33 percent in a four-way primary race. Because no candidate received a majority of the ballots cast, the top two finishers advanced to a head-to-head runoff election. Rice’s victory was a major defeat for S.C. governor Nikki Haley – who endorsed Martin and campaigned extensively on his behalf. Meanwhile it was a major victory for the political empire of neo-Confederate “Republican” consultant Richard Quinn, which will see one of its clients – liberal S.C. Senator Luke Rankin of Horry County – elevated to Martins’ post as judiciary chairman. Will it change the ideological direction of the uber-liberal State Senate? No … not even a little bit. Martin was a fiscal liberal during his two-and-a-half decades in the chamber, while Rice was a fiscal liberal during his sixteen years in the S.C. House from 1994-2010. So this author doesn’t think it will make one iota of difference. Perhaps not. But let it be known that we’ll be all over the next state senator from Pickens just like we were with Larry Martin if he turns out to be an establishment tool. And I want to see open carry within the first 20 days of the next legislative session. If not, I’ll be all over all of the senators. Congratulations to my South Carolina readers, Pat Hines, my son Joshua, and whomever else reading this in South Carolina. I really don’t have any idea how many S.C. readers I’ve got. Stay the course. … Posner is a demonstrable oath-breaker. He is unfit to pass judgment on any American, and certainly unfit to weigh in on what rights we have and how they are to be exercised. A Congress with integrity and guts would impeach him. Yes, perhaps so. I would in fact be okay with a firing squad, or hanging. No, I’m being serious. This is as much treason as giving military secrets to the enemy. When a man or woman who is in a position to adjudicate serious matters of freedom and punishment and rights for other men breaks the covenant s/he has made with the people, the people suffer. Don’t be so surprised at the judge’s position. He is following Stanley Fish, or the philosophy of deconstruction. It’s being taught at Harvard, Yale, Emory, and virtually every law school. The fact that so many judges break their covenant with the people doesn’t make it any less treasonous. See also NRO. And you can lump this hag in with Posner when you ready the firing squad as far as I’m concerned. LYMAN, SC (FOX Carolina) – Deputies with Spartanburg County said a man faces multiple attempted murder charges after opening fire outside a nightclub early Sunday morning. The shooting happened around 3:30 a.m. at Playoffz nightclub on Inman Road in Lyman. Thompson is being held at the Spartanburg County Detention Center. Wait! What? This is unpossible. Concealed carriers are supposed to go all Rambo and shoot everyone up! We’re supposed to wait for the cops to show up because of all of that super-cool tactical training and uncanny ability to wax perfect in tense situations. Or not. See, anti-gun nuts, this is how it happens in thousands of cases. In the absence of a concealed carrier, dozens might have perished or been injured. The concealed carrier is free to go. Spartanburg police are generally fairly good to gun owners and concealed carriers. The next step in the honoring of rights in South Carolina is legal open carry. Let’s press for that during the next legislative session. Now the Constitution, much like the Bible–another flawed text used for centuries as a tool of oppression and tyranny–has become a crutch for lazy leadership and moral ambiguity. It’s an excuse for cowards to masquerade as patriots. Today, the NRA treats personal gun ownership as an inviolable right, regardless of its function or purpose. To be clear, I know plenty of responsible gun owners. I want hunters to be able to hunt—but not with semiautomatic weapons. And I would like people who enjoy a little target practice to be able to do so at to their local firing range—but not with semiautomatic weapons. If you want to fire 43 bullets a minute, join the military. Just to be clear, ownership of weapons is indeed an inviolable right, but not because of the second amendment. It is so because God says so in the very document you think was a tool of tyranny. But the only tyrants here are you, Meredith, and those of your ilk who want to disarm others. You are control freaks, every one of you. The bible you criticize teaches me that any attempts I might make to control you are based in wickedness. I don’t want to control you or anyone else. I want you to have liberty. But you have no liberty to remove mine. Second, I understand that your acquiescence to bolt action rifles for hunting is merely baiting. It’s ineffective baiting, to be sure, but it’s still baiting and you don’t really mean it. I know that as soon as someone changes the calculus and does something a little different such as use a scoped bolt action rifle from a stand off distance as did Charles Whitman, you’ll come for the bolt action rifles too. Third, I know that you’re a liar, and you know it too. You don’t really want to disarm everyone, because you don’t advocate disarming the police. You just believe in the same thing all communists do, i.e., a monopoly of force. Finally, it gives me amusement and pleasure to point out the obvious. You can never effect this outcome because we have the guns. Understand? You can’t take them from us because you eschew them and we don’t. What? You didn’t really think we’d give them up, did you? And you didn’t really think those cops would want to be gunned down as they try to confiscate weapons, did you? When James Carville sat with Sarah Palin for a Politicon conversation on Sunday, he was polite. He praised her 2008 Republican National Convention speech. He even seemed to sympathize with her for being scapegoated in John McCain’s presidential campaign. But then he challenged her on wanting to “take back the country,” a common Tea Party phrase that has morphed into Donald Trump’s “Make America Great Again,” and their conversation quickly turned into a debate over gun control. “I want to take back the interpretation of our constitution that is being wrongly interpreted today,” Palin said. “Where are we going haywire on the Constitution?” he asked. Palin’s response: the Second Amendment. Carville, though, pressed her further. “Well, that is such a stupid question,” Palin responded. The Palin-Carville conversation was among a number of marquee events at Politicon, a gathering of political junkies with panels, standup comedy, film screenings and art displays at the Pasadena Convention Center. I’ll concede Carville’s point. I can say with certainty that I don’t need a 40-clip magazine. Depending upon what that beast is, it might even make my rifle too heavy and out-of-balance to shoot accurately. But I reserve the right to have one whether I need it or not. I might buy one just to have it – just as soon as I figure out what it is. As for Carville, even the US Marine Corps graduates a Gomer ever now and then. Responding to that report Saturday morning, Mr. Healy said authorities should consider creating a new list that would only be used to restrict access to weapons, separate from other similar databases, such as the “no-fly” list that contains the names of people banned from commercial air travel. Or in other words, the collectivists don’t care about your rights. He traffics in concepts of power, probability, forecasts of crime, and having just enough information to convince a single man that you shouldn’t be allowed to exercise your God-given rights, subject of course, to review by no one. I think it’s probable that Mr. Healy had personal problems growing up that are manifesting themselves in this kind of behavior, but I won’t traffic in probabilities to the extent that Mr. Healy. Here’s something I know with certainty. The desire for this kind and degree of control over other men is wicked and sinful, and Mr. Healy is a dangerous man because rather than suppress and deal with that wickedness he acts upon it to assuage those wicked desires. So do others of his ilk. Gun owners aren’t the concern. Men like Mr. Healy are the concern. My goodness. I do love me a good wheel gun. I do indeed. There’s just a feel of the machinery and a tactile connection with the revolver that I don’t get with the plastic guns, and perhaps even the 1911, which is probably my favorite platform. Advocating concealed carry of small revolvers for self defense. He’s got a good point about all of the lint. This is interesting. 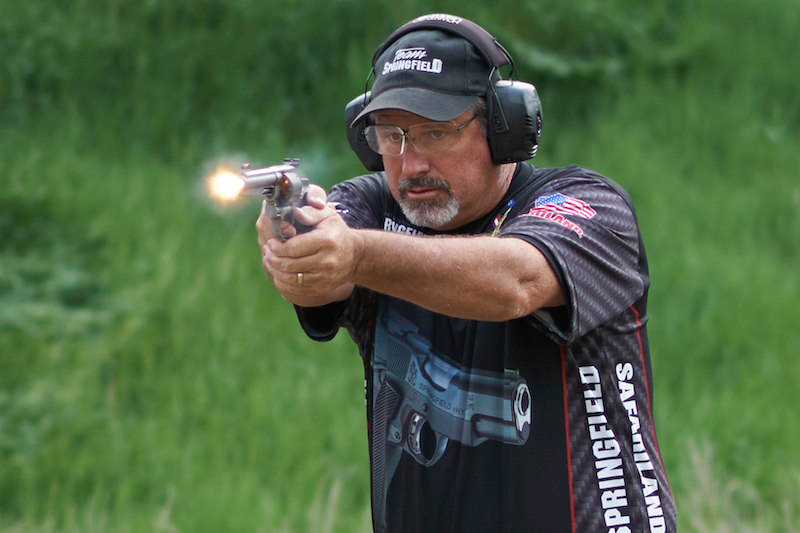 Rob Leatham wins the USPSA revolver championship. I’ve always thought of him as a pistol guy. Congratulations to Rob. I wish I was as good as he is. But I do have a question. Look at this grip he’s using. It looks like he’s using a grip customary for pistols rather than revolvers, where he is putting the thumb of his left hand near the forcing cone where it could get injured. I don’t suspect for a minute that Rob Leatham visits the pages of this blog, but could someone explain what he’s doing and why it’s okay? Well, I guess I didn’t see this one coming. Kydex holsters for a number of different revolver designs. When revolvers had safeties. Hmm … don’t think I like the idea. No, not at all. Ruger SP101 review. Ruger is making very nice revolvers these days, and I would carry this gun for personal defense in a heartbeat. It doesn’t look nearly as pretty as the Ruger GP100 Match Champion, but then again, you can’t conceal a GP100 Match Champion. I do think they should have made the entire grip that nice looking wood rather than embedding it in the rubber grips. I still want someone – anyone – with personal knowledge to give me a story of someone in OIF or OEF (Iraq or Afghanistan theaters) carrying a revolver rather than a pistol.